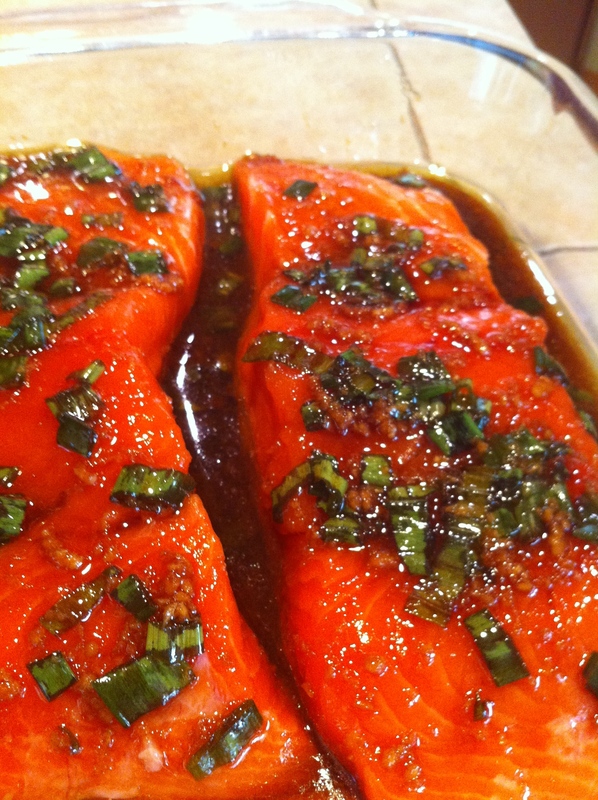 My buddy gave me this recipe about three years ago and I must say, it is a great way to cook salmon. 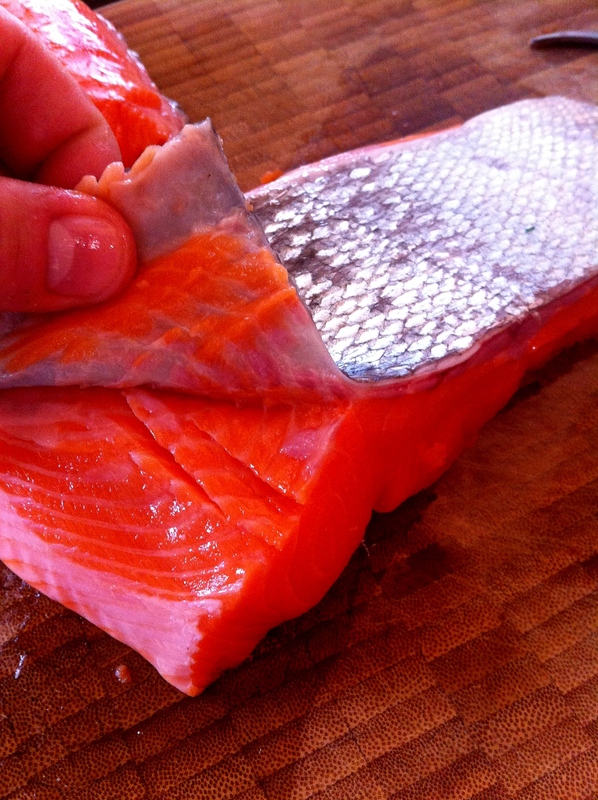 Especially fresh Spring King Salmon from the Columbia River in Oregon. I made it the next day after a client caught a fish and gave me a little to take home to the family. I ran home like a kid that won the Willy Wonka golden ticket. First thing I do with these coveted filets, is take the pin bones out of them. Nothing worse than growing up as a kid and getting a bone in the mouth, I hated it and it ruined my salmon experience. So grab a pair of needle nose pliers and get to work, takes less than a minute. Carefully press your fingers along the top feeling for bone pricks in your fingers, then take your needle nose pliers and remove them. Then I gently turn the filets over and remove the chrome skin off the filet. 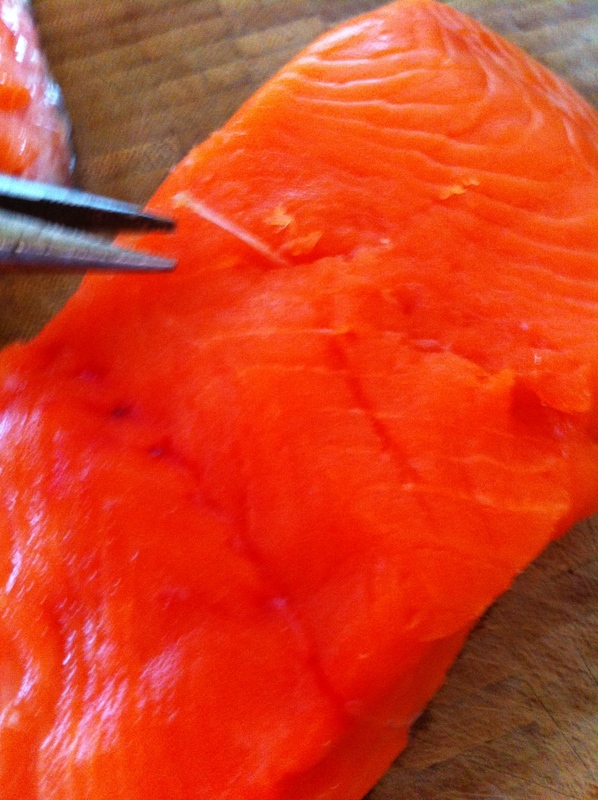 Take your time and use a sharp filet knife and remove the skin from the salmon meat. 1/3 cup of chopped green onions (just the green portion). 1 tablespoon of grated fresh ginger root (peel the skin than grate it). Mix all the ingredients together and place filets in shallow cooking dish and pour over the top of them to marinate for 2 hours. Turn them every 30 minutes. Make sure to turn them every 30 minutes to get all the flavor. 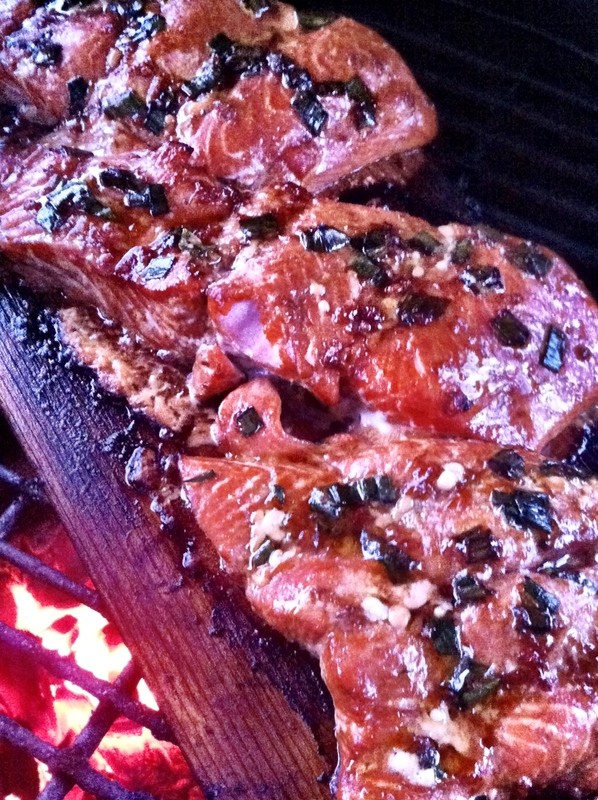 While the fish is in the marinade, take your two cedar planks and soak them in the water. About 3o minutes from removing fish from the marinade get your green egg rolling or your bbq, bring the heat up to 375 degrees or 400. The key here is not to burn your planks so fast fish is not cooking. Before you put your fish on the planks, take olive oil and rub them down, this will keep the fish from over sticking to the boards. Put your planks on the bbq and close the cover. Make sure to check it, to make sure your planks are not on fire. If they are gently take a spray gun and wet them down. The fish has a nice brown tint to it from the marinade and smoke from the Green Egg. It takes roughly 20 minutes and you want to use a fork or a knife and flake it, when it gently pulls apart remove and serve because the fish will continue to cook. 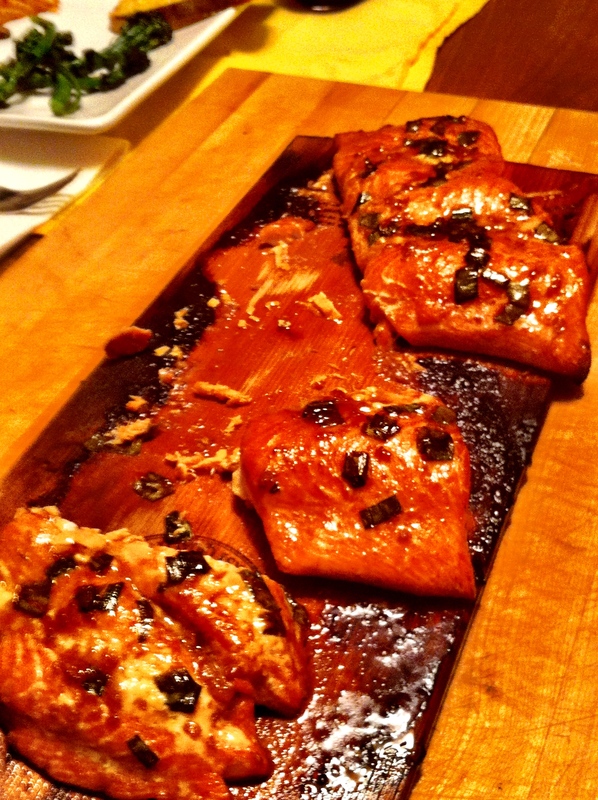 I like to serve them on the plank but if you do this make sure that your table is set and sides ready to roll with people at their seats because the salmon will over cook. I like to serve it on the cedar planks because it gives your guest the smell of the burning cedar table side. Served on the Cedar plank! 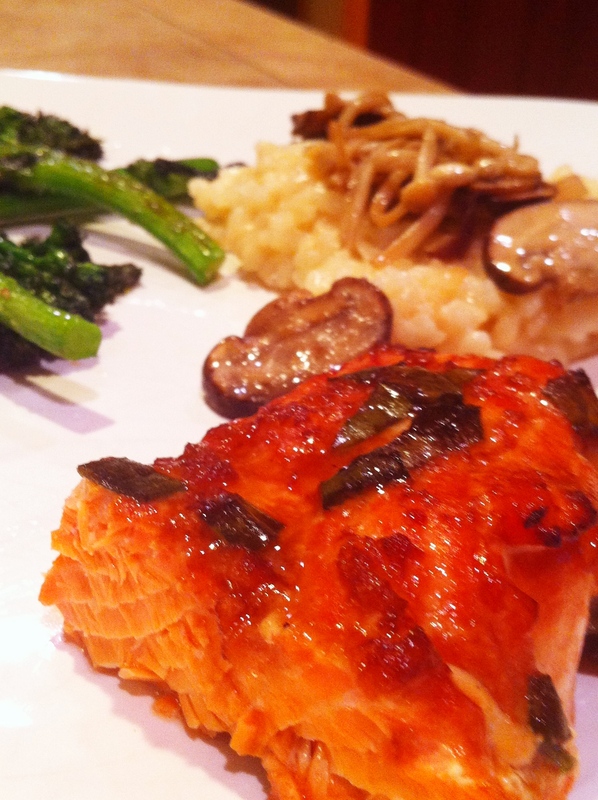 I served this dish with wild mushroom risotto, lemon garlic broccolini, and of course fresh bread and wine. Look at the color of this Columbia River Springer Salmon! This is a dish that you can easily pull off if you pay attention and take your time on the bbq. Make sure to not cook it so hot that the boards burn and that you want to pull the salmon and serve immediately when the fish gently flakes. That looks perfect. I love planking salmon, one of the best and easiest ways to do it. I’ll be giving your marinade a try. Thanks for sharing it. Sometimes the planking gives a little too much smokey taste. Also try red onions instead of green onions, gives it a different flavor. Let me know what you think!